Still drawing fun lovers seeking a game of miniature golf is this course at the Whale’s Tale that was revitalized with a nautical theme 20 years ago. 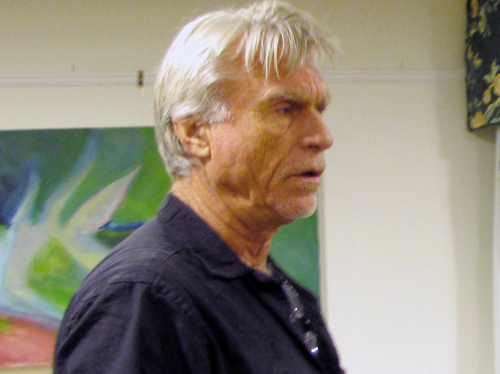 JULIE LANE FILE PHOTO | Inventor Ken von der Heyden speaking with the Waterways Management Advisory Council in March. The writing has been on the wall practically from the beginning, but at its Monday night meeting, the Waterways Management Advisory Council brought an end to its consideration of the proposal for the MoonCurrent tidal turbine system that, according to its inventor, would save Island residents money on electric bills. Inventor E.K. von der Heyden of Sag Harbor has been shuttling between the Town Board and WMAC trying to get permission to dock his invention in the South Ferry Channel, not far from where South Ferry launches its boats to North Haven. Committee member James Eklund said he wouldn’t have objected to a short-term off-season docking and test, but Mr. von der Heyden has been emphatic about needing a long-term test in order to satisfy potential investors. It’s a narrow channel that’s heavily used, especially in the summer, said WMAC Chairman John Needham. However, Mr. Needham also reported that Bill Clark of the South Ferry had voiced no objection to the turbine’s location. But Peter Reich, a Town Board liaison to WMAC, voiced concern about the system’s electrical cable, which would be free-floating, not buried as other cables are. He saw anchoring the cable as a problem and believed there was a potential for it to snap. “Electricity and water don’t mix,” he said. WMAC member Bill Geraghty called it “a science project” that hadn’t been thought through. “I don’t think he’s done his engineering work on it,” member George Zinger said. A strong westerly wind would drag the platform in front of the ferry slips, he predicted. “I can’t believe we’re talking about it,” member Marc Wein commented. If a group like the Long Island Power Authority brought a plan with all the engineering in place, it would be different, he said. At the end of the discussion, the board voted unanimously, 6-0 with Alfred Loreto absent, to recommend to the Town Board that it cancel any further consideration of the project. Mr. von der Heyden, who wasn’t at Monday night’s meeting, said in a telephone interview Tuesday morning, he has been “gathering experts” and would still like an opportunity to present his plan to the people of Shelter Island and explain how it could lower their electric rates. “It’s never been explained to anybody,” he said. • Approval of an application from Russell Ireland of 118 South Midway Road for a stake, mooring and pulley system in West Neck Harbor. Mr. Wein voted against the recommendation, saying he wouldn’t object to a mooring, but saw a stake pulley system setting a precedent in that area that could result in a string of “clotheslines” coming out from the shore. The others supported the application, but said if there’s a need to go more than 100 feet out from the mean high water mark, Mr. Ireland would have to come back for permission. • Approval of an application from John and Tatem Fichthorn of 19 Montclair Avenue to replace 102 feet of bulkhead, install a new backing system; provide 10 feet of non-turf buffer landward of the bulkhead; revegetate the area with native plants; reconstruct 60 feet of the end of an offshore fixed dock; replace pilings, caps, stringers and decking; and install a new 32-foot by 2-foot seasonal ramp and a 6-foot by 20-foot floating dock secured by two-pile anchor dolphins. • Approval of an applºication from James Corl of 5 Winthrop Road for a riparian mooring located 165 feet off the end of his dock in Dering Harbor, east of his waterfront property. • Approval of an application from James Eklund of 59 South Midway Road for a private mooring that had been occupied by Doug Matz. Mr. Eklund recused himself from the vote. There won’t be a moorings grid in West Neck Bay — at least not anytime soon. That was the decision of the Waterways Management Advisory Council Monday night. The idea of creating a grid for existing moorings had been suggested by Councilman Peter Reich but he and committee members bowed to the thinking of Emory Breiner, a Planning Board member, who appealed to the WMAC not to take action he said could start a run on moorings. In an April 30 letter to the Town Board, Mr. Breiner wrote that creating a grid would unnecessarily tighten the number of available mooring spaces, prompting people to request them even if they didn’t yet have boats. “A West Neck Bay mooring will be coveted like a rent-controlled apartment,” Mr. Breiner wrote. “West Neck Bay is not on the way to becoming another Dering Harbor,” he said. The existence of the Shelter Island Yacht Club in Dering Harbor with more than 300 active boaters, Piccozzi’s Dering Harbor Marina and the Dering Harbor Inn’s dock are what have created congestion there, he said. “West Neck Bay is strictly a residential bay,” Mr. Breiner wrote. “There has not been the buildup in moorings to justify the closure,” he said about the impact of creating a grid. The board agreed to informally move a planned southeastern borderline of the field further south but it won’t be proposing any formal arrangements to the Town Board to redefine the field. At the same time, members grumbled that while they understood their role as an advisory board, they wished Town Board members would take their advice more often. Councilman Ed Brown insisted that 99 percent of the time, the Town Board does follow WMAC recommendations, but member Bill Geraghty said he didn’t believe that statistic. The board also discussed adopting standards to guide its review of applications that come before it. Unable to agree on what those guidelines should be, they said they’d go back to the drawing board and try to come up with some specifics on which a majority could agree. Nor could the advisory committee agree with Marc Wein’s suggestion that a waiting list of those seeking moorings be published annually in the Reporter. His colleagues argued that those on a waiting list could find out their status by checking with the Town Clerk. WMAC members grappled with an application from Richard Walsh of 49 Dinah Rock Road to install a boatlift to handle a 25-foot center console Dusky 252 Fisherman’s Cuddy. The major bone of contention among members was whether an 8,000-pound lift would suffice. Mr. Geraghty and Chairman John Needham weren’t convinced that a 10,000-pound lift was necessary but the other five members voted to recommend it. Committee member Michael Anglin said he wouldn’t want to trust an under-sized lift. All agreed that a forklift design would be appropriate. • Bill Smith’s application to place a private mooring in Coecles Harbor near his house at 14 Hudson Avenue. • Stephen Houston’s application for a Riparian mooring in Dering Harbor near his house at 50 Winthrop Road. • Philip and Dianne Bailey for a Dering Harbor mooring near their house at 56 Menantic Road. • Richard Radigan for a private mooring in Dering Harbor near his house at 5 Community Drive. • Richard Sesti for a stake, mooring and pulley system to serve him from his house at 7 North Brander Parkway.